Due to warming temperatures, all skating ponds and rinks have been closed for the season. 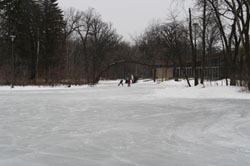 The city operates numerous outdoor pleasure skating rinks located in parks. Certain highly used pleasure rinks have heated washrooms and warming shelters which are open to the public throughout the week as well as posted hours on weekends. Many small neighbourhood hockey rinks are also maintained for public use. The City of Winnipeg is only responsible for the installation and removal of the KNOCK DOWN outdoor hockey rinks located at Community Centres. The installation and maintenance of the ice is the responsibility of the Community Centre. 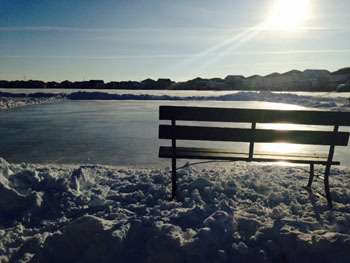 To obtain information on the hours of operation and location of skating rinks in your neighbourhood please contact your Community Centre. The city operates numerous skating rinks located in parks, school sites and at Community Centres. Certain highly used skating rinks have heated washrooms and warming shelters which are open to the public throughout the week as well as posted hours on weekends. Many small neighbourhood rinks are also maintained for public use. No organized hockey allowed on pleasure rinks. Please use your local Community Centre outdoor rink for hockey play. Many of the pleasure rinks will be ready to use before the holiday season, depending on the cooperation of the weather. Abdo and Samira El Tassi Park 100 Elmwood Rd. Archambault Park 224 Rutledge Cres. Brentford Park 70 Brentford Rd. Bunn's Creek Centennial Park 365 McIvor Ave.
Elmwood Winter Club 75 Brazier St.
Hap Hopkinson Park 1043 Manhattan Ave.
Kingston Park 320 Kingston Cr. Parc De La Seigneurie 175 De La Seigneurie Blvd. Sir Winston Churchill 150 John Duncan Dr.
Central Park 400 Cumberland Ave.
Colish Tot Lot 19 Colish Dr.
Helen Promislow Park 295 Kingsbury Ave.
Lake Ridge Park 41 Lake Ridge Rd. Magnus Eliason Recreation Centre 430 Langside St.
Old Market Square 275 Bannatyne Ave.
Primrose Park 46 Primrose Cres. Tanoak Tot Lot 53 Hillhouse Rd. Turtle Island 510 King St.
Tyndall Park C.C. - Garden Grove Site 2370 Burrows Ave.
Vimy Ridge Memorial Park 821 Preston Ave.
Belair Park 15 Belair Rd. Byng Park 913 Byng Pl. Caron Park 50 Cass St.
Crescent Drive Park 781 Crescent Dr.
Dorge Park 30 Dorge Dr.
Fort Rouge Leisure Center 625 Osborne St.
Harrow Park 1000 Fleet Ave.
Parc de Moissac 920 St. Gabriel Ave.
Aerate, top dress, and fertilize soccer, baseball and football pitches? The fee only contributes to approximately 50% of the total cost of these services. This youth athletic fee is already included in your registration fee, and is approximately $10 per participant.